Welcome to this beautiful little historic village of Rossville, Tennesse – conveniently located just 7 miles east of the historic town square in Collierville, TN. and all of the conveniences one could ask for – Carriage Crossing Mall, Baptist Hospital, Employment Centers, Churchs and an abundance of Restaurants. 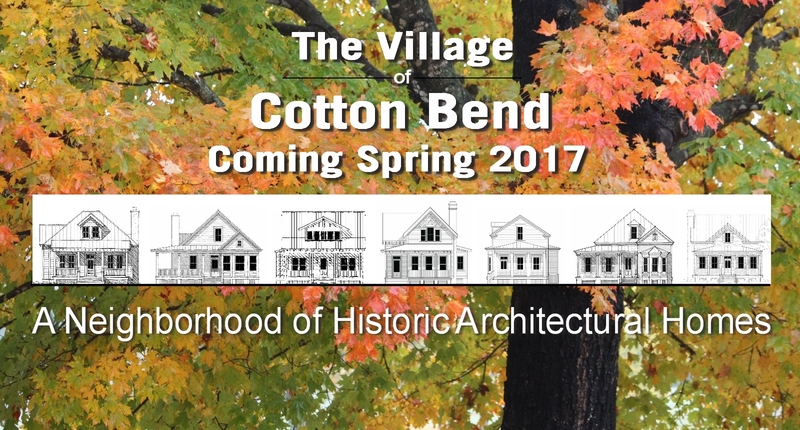 In Keeping with the charming character of the Town Square and Main Street in the quaint little Village of Rossville, Renaissance is developing The Village at Cotton Bend in a manner which will capture the atmosphere of by-gone days where families related on their front porch while visitng with neighbors. Located within walking distance of Main Street, the historic town square (Wolf River Cafe) and Rossville Christian Academy, Renaissance has chosen the Traditional Neighborhood Design principals of neighborhood creation for this beautiful development (walkability, front porches, historic architecture, open spaces, alley accessed garages). Architecture being the fundamental component, Renaissance has enlisted one of the most recognized and aware winning architectural firms familiar with TND styled developments to provide historically correct home plans for The Village at Cotton Bend.